The Mathematics Behind xkcd: A conversation with Randall Munroe. Carl Bialik at the Wall Street Journal writes about which voters are the most powerful in US presidential elections. Forget your fancy data science: try overkill analytics. Dynamic pricing for drinks, from Wired via io9. An overview of mathematics at Google. Call me maybe and the prisoner’s dilemma. Optimizing your baggage claim experience. Friends you can count on, from Steven Strogatz’ current New York Times series “Me, Myself, and Math”. The Toolbox, the first episode of Samuel Hansen’s 8-episode audio series featuring stories from the world of mathematics. Terry Tao has written a probablistic heuristic justification of the abc conjecture. This is old news, but Stanford has an archive of Knuth video lectures. 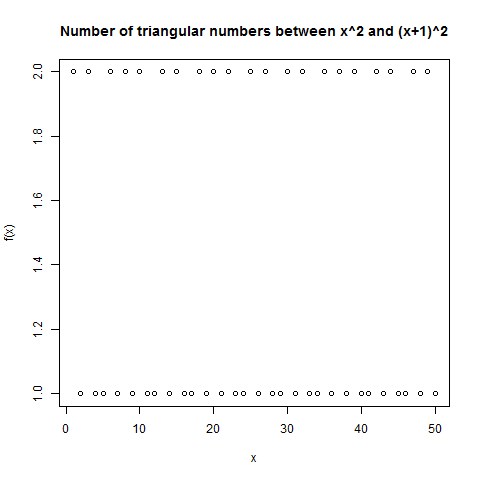 As there are “more” triang nmbrs than sq nmbrs http://www.jamestanton.com/?p=1009 let f(N) = nmbr triangs >= N^2 but < (N+1)^2. Curious:What graph like? The th triangular number is about (more precisely, it’s .) So there are about triangular numbers less than . Therefore, “on average”, in each interval there are triangular numbers. For example, in the interval [9, 16) there are two triangular numbers, namely 10 and 15; this is f(3). In the interval [16, 25) there is one triangular number, namely 21; this is f(4). Next we write g(x) in terms of t(x). It’s tempting to say that g(x) = \lfloor t(x) \rfloor, but it’s not. t(10) = 4, for example, but we want g(10) = 3. We’ll say that — we’ll only need this formula to work when x is an integer. So, for example, , and the index of 9.875 in the triangular number sequence, whatever that means, is between 3 and 4. But . which makes the formula marginally easier to write. In particular the arguments of these two floor functions differ by , which is between 1 or 2, so f(n) is always either 1 or 2. The graph that Tanton asked about is below. You can see some hints of periodicity in the function; for example, from a quick glance at the graph it might look like has period 12, each period containing five 2s and seven 1s. But this can’t hold, not unless . In fact can’t be periodic, because is irrational. Larry Wasserman writes on Hunting for Manifolds. Given data that are close to some manifold, how do we estimate the underlying manifold? RAND’s presidential election poll features some unorthodox methodology, including asking the same people repeatedly and asking them explicitly for the percentage chance that they’ll vote. Steven Strogatz has a new series of math blog posts at the New York Times. Life expectancy doesn’t measure how long you’re expected to live. Austin Mohr has created Spacebook, a searchable database of topological spaces inspired by Counterexamples in Topology . Handouts from Geometry and the Imagination, a summer workshop by John Conway, Peter Doyle, Jane Gilman and Bill Thurston in 1991. An interesting visualization of prime factorization. The best video I’ve ever seen on combinatorial explosion. The 10 Turkish lira note has math on it. I was inordinately amused by this when I discovered it yesterday, totally by accident when my girlfriend was showing me some money she picked up on a layover in Istanbul. In particular it includes a picture of Cahit Arf, whose work I am not familiar with but who appears to be one of the great Turkish mathematicians. This was basically domestic nerd sniping. 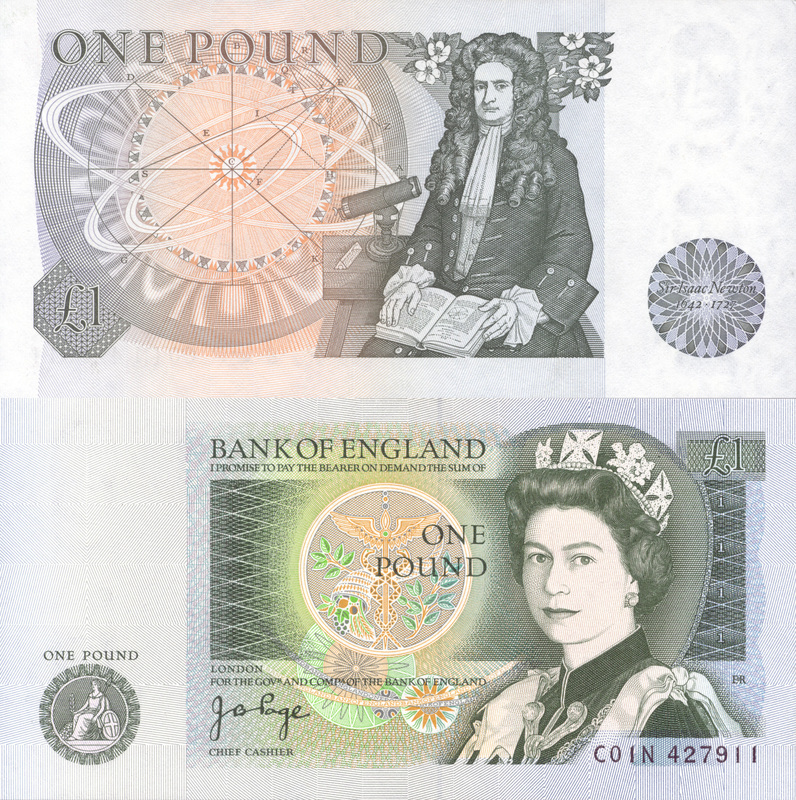 For more thorough coverage, see Jacob Bourjaily’s scientists and mathematicians on money. You may also be interested in purchasing portraits of Gauss. 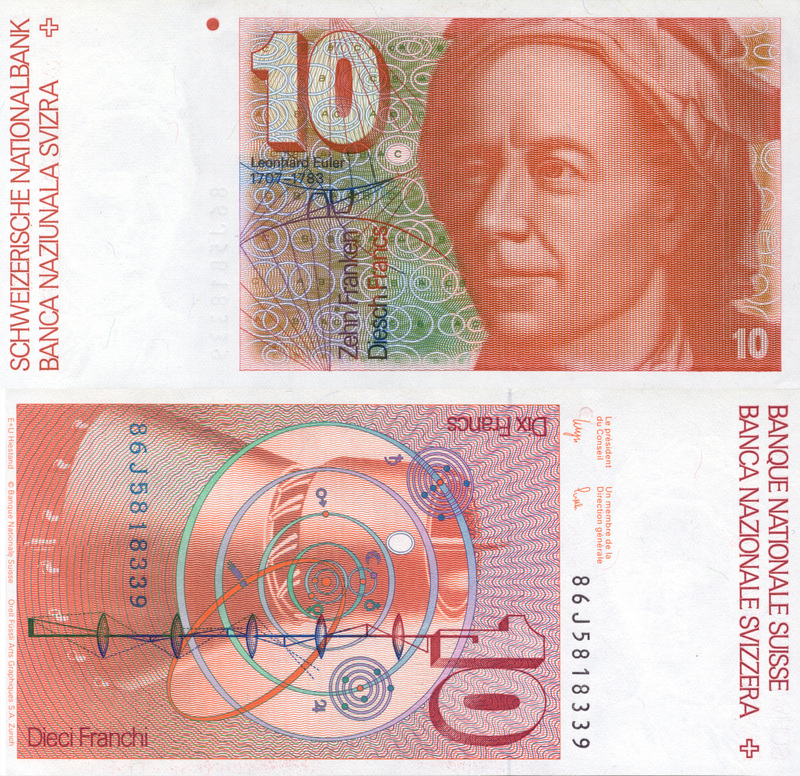 Newton was on the one-pound note when there was such a thing; the Euler ten-Swiss-franc note is out of print. Bourjaily collects notes with scientists and mathematicians on them and has a list of what he’s looking for; perhaps you can help him out? Aaron Clauset and Ryan Woodard, Estimating the historical and future probabilities of large terrorist events. Via physics arxiv blog. Secrets of Alice in Wonderland, alternating between the reading of pieces of the Alice in Wonderland stories by Cobi Smith and explanations of the underlying mathematics by David Butler. If you like this sort of thing you might be interested in The Annotated Alice: The Definitive Edition , by Lewis Carroll and Martin Gardner.